Today we continue on with our Wallpaper theme! You've already seen how to Manage your wallpaper in GNOME as well as how to set up a changing rotation of wallpapers with Wallpaper Drapes (see "Desktop Drapes for GNOME"). Now it's time for something a bit different. Most wallpaper applets pretty much do the same thing: They will either place a picture on your desktop or manage multiple pictures that will change at a set interval. For the most part there is little variation in these tools. But one such tool offers a single addition to the standard wallpaper manager that sets it apart. That tool is anyPaper. And that feature allows you to place your image anywhere on your desktop you like. For those that use icons on their desktop, this is actually a most welcome feature (you'll understand in a bit). And, unlike most tools, AnyPaper actually offers you a preview of what your desktop will look like. anyPaper is a front end for the wallpapersetter command. And in this article I will show you how to install and use the handy desktop wallpaper tool anyPaper. Open up your Add/Remove Software utility. Search for "anypaper" (no quotes). That's it. If you do not already have the wallpapersetter command installed, anypaper should pick this up as a dependency. You are now ready to go. File: The image you want to use as your wallpaper. Style: Adjusted, Fullscreen, Tiled, Normal, Scaled, Custom Scaled. If you want to move an image to a specific spot on your desktop you must use Adjusted (and the image must be smaller than your actual desktop). Background: Color to fill empty spaces. Position x: The horizontal placement of your image. Position y: The vertical placement of your image. Height: Custom height.Finally, on this tab, you can preview what your wallpaper will look like by hitting the Preview button. This only opens your wallpaper in a viewer window. Default output file: This will be the file wallpapersetter uses as the actual wallpaper. Command: Any command line options you want to use (see man wallpapersetter for a list of options). Style: This is a list of four possible scaling options used in GTK from the gdk_pixbuf library. Once you have made all the necessary adjustments click the Save As button (to save your options) and then click Apply. The Apply button will actually apply the wallpaper to your desktop. It's not filled with tons of tools and it won't rotate a directory full of wallpapers on your desktop. What anyPaper does, however, is place your wallpaper exactly where you want it on your desktop. 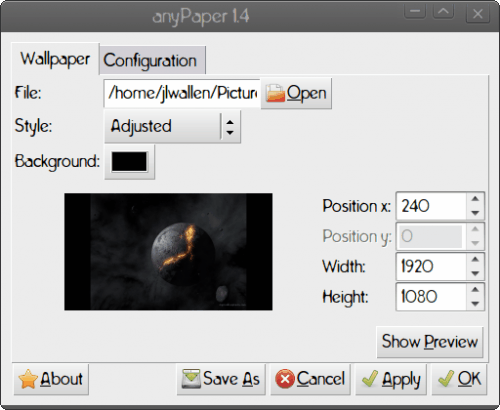 If you're very picky about how your desktop looks, you might give anyPaper a try. People should try out the freeware wallpaper changer Muralpix.